Artist Anila Quayyum Agha's exhibit, All The Flowers Are For Me, will be on display at Cuesta College's Harold J. Miossi Gallery through Sept. 22 with an opening reception with the artist on Aug. 24 from 4:30 to 7:30 p.m. Agha will give a talk on the exhibit at 5:30 p.m. Visit cuesta.edu for more gallery information. You don't simply look at artist Anila Quayyum Agha's art, you walk through it. At 5 cubed-feet, the painted metallic cube easily takes over the room. A single bulb inside casts intricate designs and shadows onto the walls and floors, and when viewers walk through it, they become part of the art. "I see myself as an artist talking about my world and how I can make it better," Agha said. IMMERSIVE A single bulb in artist Anila Quayyum Agha's installation piece on display at Cuesta College's Harold J. Miossi Gallery reflects an intricate pattern onto the walls and floor. The Pakistan-born artist's exhibit, All The Flowers Are For Me, will be on display at Cuesta College's Harold J. Miossi Gallery from Aug. 24 to Sept. 22. Her work deals with themes like global politics, cultural multiplicity, mass media, and gender roles. Born in Lahore, Pakistan, Agha remembers making art from an early age. When she painted a watercolor scene of the mountains in grade school, her teacher stopped to look at it and said, "You're going to be an artist." That moment stuck with Agha for a long time, and she went on to secretly apply and get accepted into the National College of Arts in Lahore, Pakistan's only art school at that time. In 1999, she left her homeland to move to the U.S., where she attended graduate school to study fiber arts at the University of North Texas. She is now an art professor at the Herron School of Art and Design in Indianapolis and also crafts her own work. Still, Agha doesn't like to define herself by a single medium, or country for that matter, and thinks of herself as a interdisciplinary artist. 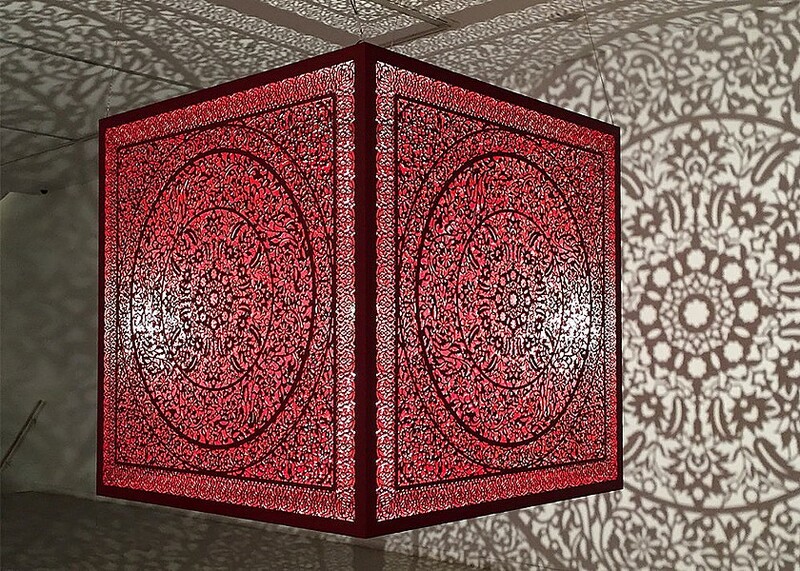 Her current focus on cubes and symbols is influenced by a combination of modern Islamic art and architecture. Agha's creative process is typically kick-started by an idea and she then finds the shape or medium to express that concept. For the show at Cuesta College, Agha took the idea of feeling uncomfortable in a space that is supposed to be safe. 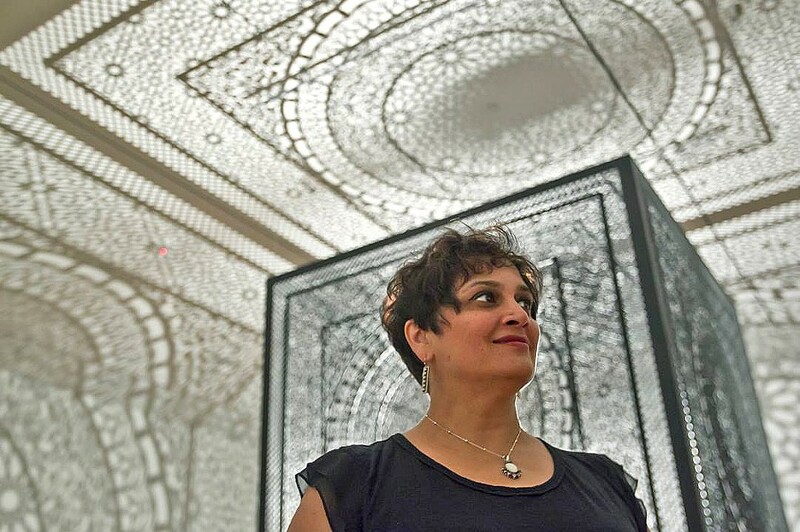 OUTSIDE THE BOX Pakistani-American artist Anila Quayyum Agha was born in Pakistan and works with themes like immigration and feeling like an outsider. "It kind of comes from a place of being an outsider," Agha said. "We are surrounded by issues like race and creed, whether we belong, and having the freedom to be ourselves." On the other side of the coin, Agha said that All The Flowers Are For Me also evokes the idea of desire, as in the desire to be accepted, to be valuable as a person of color or as a woman. "It's particularly exciting for Cuesta to be exhibiting this important work at this particular moment in time," Cuesta College's Harold J. Miossi Art Gallery Coordinator Emma Saperstein said in a statement. "Her work is timely, cross-disciplinary, and immersive, and I am thrilled to be exhibiting it here." In the current divisive political climate in America, where phrases like "Black Lives Matter," and "neo-Nazis," are thrown around with equal amounts of frequency, Agha said she is looking to create a conversation. Arts Editor Ryah Cooley wonders, "What's the meaning?" at rcooley@newtimesslo.com.